There have been a few murmurs that the partnership between Micromax and Cyanogen is near end-of-life, and here's a clear sign that Micromax's Yu might be looking at life beyond its software partner. Yu's popular Yureka Plus smartphone - that originally launched with Cyanogen OS 12 - has been listed on Amazon India with Android v4.4.4 and is available via an open sale at Rs. 8,999. The listing says the Yureka Plus is upgradable to Androi v5.0.2. Rest of the specifications seem identical to the Yu Yureka Plus (Review) that launched with Cyanogen OS in July, with the smartphone featuring a 5.5-inch full-HD (1080x1920 pixels) IPS display and a 64-bit oct-core Snapdragon 615 SoC (MSM8939) clocked at 1.5GHz, coupled with Adreno 405 GPU and 2GB of RAM. The Yu Yureka Plus sports a 13-megapixel autofocus camera with an LED flash, and a front-facing 5-megapixel fixed-focus camera is also on board. The Yureka Plus comes with 16GB of inbuilt storage with microSD card support (up to 32GB), and packs a 2500mAh battery. The Yu Yureka Plus is a dual SIM (GSM+GSM) smartphone that comes with connectivity options like Bluetooth 4.0, Micro-USB, Wi-Fi 802.11 b/g/n, GPS, and a 3.5mm audio jack. The Yu Yureka Plus include sensors such as accelerometer, proximity sensor, ambient light sensor, and gyroscope. 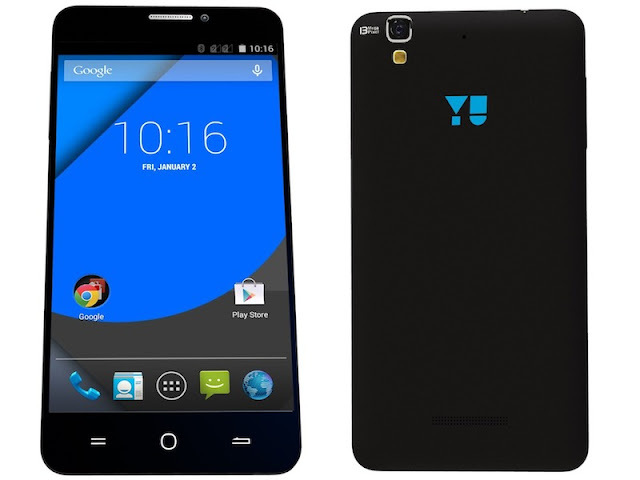 To recall, the Yu Yureka Plus was launched carrying a price tag of Rs. 9,999 but the price was slashed to Rs. 8,999 within a couple of weeks of launch. The Yureka Plus with Android is available at the new price of Rs. 8,999, albeit in only the Mooniest Grey colour. The Yu Yureka Plus is limited to one unit per customer, Amazon India notes.